The small and elegant Mukteswar Temple with its famous stone arch at the entrance is the gem of Orissan Architecture. The temple is also important as a transition point between the early and later phases of Kalinga School of Architecture for which this dance festival is named after the said temple. The embellishments of Mukteswar and Parsurameswar temple reflect the best of Orissan Architectural Style and provide an ideal platform for the Odissi Classical Dance. The Mukteswar Temple in Bhubaneswar, famous for its elegantly carved arched gateway is considered as one of the finest examples of Odishan architecture. The complex of this legendary temple serves as the venue of the Mukteswar Dance Festival. 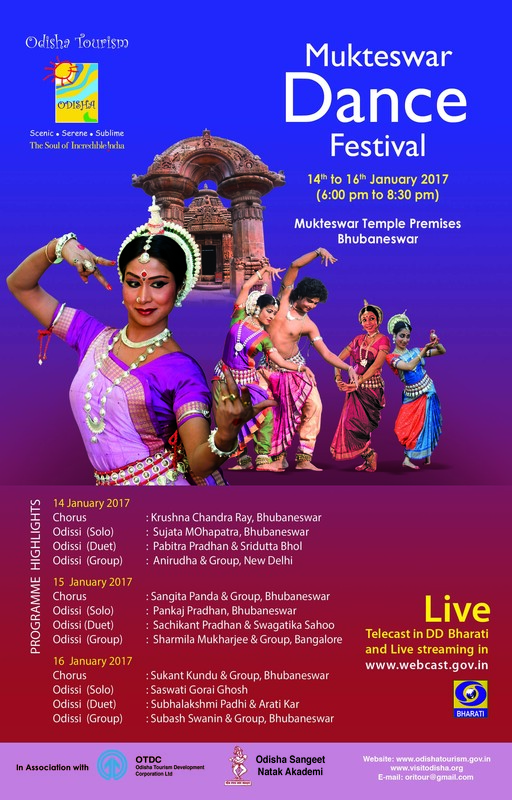 This festival celebrates the unrivalled charisma of Odissi, the classical dance form of Odisha. Star Odissi dancers tapping their feet to the strokes of the accompanying instruments like mardal mesmerize the audience with their classic attire and graceful movements. Solo, duet and group performances by these dancers, their abhinaya, bhangi and mudra give the onlookers a transcendental experience.